You – the customer – are at the centre of our activities. We want to work in such a way that you can recommend our services to anyone at any time. We cooperate with our customers as partners and our customer relations are long-lasting. 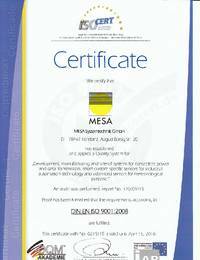 As your partner specialized in measuring and automation technologies, MESA optimizes the cost effectiveness of your industrial processes. Closely cooperating with our partners, our success is based on the performance, the long life and the quality of our products. Our products are applied in a variety of industries. We have customers in traditional mechanical engineering, process technology, medical engineering as well as in the oil and gas industries. Our job is not only the development of own products but also the implementation of application-specific adaptations as well as the entire design and production of customized products. We are an innovative enterprise and, as a technology leader, always one step ahead of the market. The products are not subject to any wear and tear. For measuring devices, only periodic calibration works are required. For you, our customer, this means that you will not incur any maintenance or service costs after the purchase of our products. We want to set standards and push progress ahead. At MESA, the future starts already today. A team of graduated engineers develops innovative solutions by means of advanced methods and technologies. All modules are assembled according to plans and documentation prepared by our Development Department. Both departments are located next to each other on the same floor. Change requests or replacement of discontinued components can thus be implemented in the current series almost without delay and loss of communication. Using production facilities designed by ourselves, we can carry out test steps and the necessary calibration and adjustment works in a reliable and reproducible way. Up to a few thousand units/type/year of the prototype are produced by our staff. Each member of our staff is a source of new ideas. MESA encourages and expects independent working. This is why MESA also promotes the development and consolidation of know-how and skills among its staff. At the same time, we appreciate the long-standing relationship between the company and our loyal permanent staff in the departments Development, Production and Sales. Located in the middle of Europe, Constance can be reached easily from all directions. We are less than an hour’s drive away from the international airport Zurich and a one-and-a-half hours’ drive from the airport Stuttgart. MESA is situated on the outskirts of Constance, next to the nature reserve Wollmatinger Ried. We would be glad to show you more about our work and present our team to you here on site. MESA is permanently working on the improvement of its processes. This includes all departments, from Development to Production, Sales and Service. We invest in additional resources in all areas in order to achieve the optimum solution for our customers. All of our processes have been certified since 2002 and undergo an annual reaudit. Senden Sie uns eine Nachricht, wir werden versuchen diese schnellstmöglich zu bearbeiten. Ich bin damit einverstanden, dass MESA meine Daten durch das Formular sammelt.